We LOVE Christmas cookies! I’ve been hosting an annual Cookie Exchange for the past 16 years and love trying new recipes each year, and getting all the cookies and recipes from the other ladies that come to my cookie exchange each year. I will share a recipe each day for the next 12 days, the “12 Days of Cookies”. Enjoy! In a large mixing bowl stir together all ingredients; set aside. 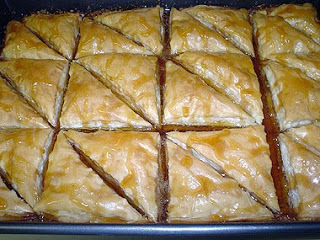 While Baklava is cooking, in a medium saucepan stir together the 1 1/2 cups sugar, honey, lemon peel, lemon juice, stick cinnamon and 1 cup water. Bring to boiling. Reduce heat and simmer, uncovered, for 20 minutes. Remove cinnamon. This recipe, and 349 others, can be found in our cookbook “Rocky Mountain Lodge & Cabins Favorite Recipes”. You can order your copy at our Gift Shop. Click here to order!